Although it's unlikely that the Christmas tree as we know it today was first used in the 7th Century, some people believe the idea for the tree was invented by St. Boniface at that time. There are different legends regarding how St. Boniface invented the Christmas tree. Some claim he used the triangular shape of the fir tree to symbolize the Holy Trinity of God the Father, the Son, and the Holy Spirit to un-believers, and that these new converts began to worship the tree as a Christian symbol. 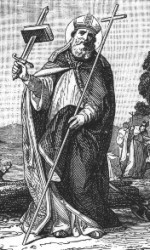 Another version of this legend claims that St. Boniface chopped down an oak tree worshiped by pagans, and used a fir tree growing in the roots of the oak as a symbol of Jesus. There are also claims that the first proper Christmas tree was erected in Riga, Latvia in 1510. Today, there is a plaque in the Town Hall Square in Riga that is engraved with the text "The First New Year's Tree in Riga in 1510". It is believed that this tree was burned during a New Year's celebration, and possibly decorated with paper flowers. However, it seems more likely that this celebration was related more to the Christmas tree's pagan past. The most likely Christian beginnings of the modern Christmas tree were in the mid 1500's in Germany. In 1521 in the region of Alsace (formerly part of Germany), the first pine tree was decorated and used in a Christmas celebration. In 1539, in the Cathedral of Strasbourg, there are church records that state a Christmas tree was used for the Christmas celebration. And in 1570 there are reports from a Bremen guild cronical that a fir tree was decorated with fruits and nuts which children ate on Christmas day. In the 1700's the Christmas tree custom had spread throughout northern Germany, and people began decorating the tree with candles that were lit on Christmas Eve, as is still done today in many homes across Europe. As the Christmas tree custom spread through Germany, the Roman Catholic Church eventually recognized it in the early 1800's. It was introduced to Vienna in 1816, quickly spreading across Austria, and in 1840 to France by the duchesse d'Orleans. The Christmas tree was introduced separately in different US cities by German immigrants, most likely in the mid 1700's. Several US cities claim to have had the first Christmas tree in America. Bethlehem, PA appears to have had the first decorated Christmas tree in 1747 at the German Moravian Church settlement, however it was made by putting evergreen branches on a wooden pyramid! Windsor Locks, CT claims they have earliest date in 1777, while Easton, PA also claims the first Christmas tree in 1816! Since these first real Christmas trees, there have been many changes leading to today's modern Christmas tree!